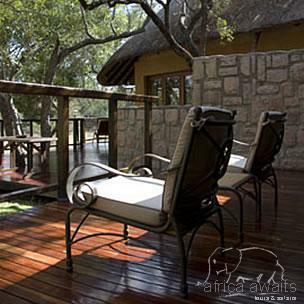 Nestled in the heart of the Thornybush Reserve bordering the Kurger National Park lies Shumbalala Game Lodge. Situated on the banks of the seasonal Monwana river the camp is an unexpected oasis of luxury and comfort in the unforgiving heat of the African bushveld. The Shumbalala Game Lodge camp is a unique place where the African wild is spoiled only by the quiet appreciation of guests being waited upon in the true tradition of Africa in their luxurious surroundings. There is an immediate sense of tranquility, opulence and space complimented by the camp's custom designed buildings with it's African décor, high thatched roofs and attention to the finest detail. The lodge consists of a select number of superior suites and the exclusive Pesidential Suite. The spacious superior suites each comprise of a bedroom and lounge, en-suite bathroom, large glass sliding doors and private viewing decks with a view over the ever active water hole. 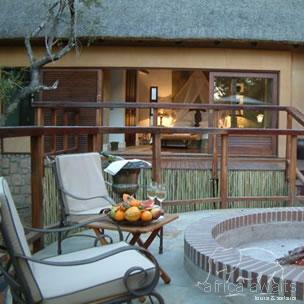 Natural colours, wooden decks and thatched roofs compliment the bushveld surroundings. The Presidential Suite, a total of 225sqm includes two full en-suite bedrooms, a private dining room, private lounge, fireplace, wrap around private deck with outside dining facilities, a private boma and private plunge pool. Standard amenities include overhead fans and air-conditioning providing welcome relief from the bushveld climate. Open fireplaces for the cooler winters, and designer "picture window" bathroom suites provides for an atmosphere that is Africa and romance at once. Features like the additional secluded outside showers cater for the more adventurous! 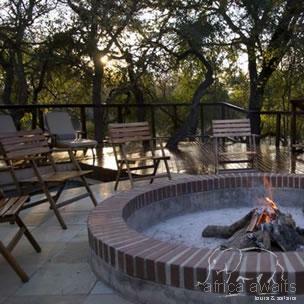 In addition to the game viewing activities guests have time to relax and enjoy the surroundings on the game viewing decks overlooking the water hole frequented by game. There are two welcoming lounges inviting you to sit back and enjoy the pampering. Spend lazy afternoons at the pool, reading in our private library with a selection of wildlife books, select a prized African gift in our curio shop, bird watching or just relax in the comfort of your suite. Dinner is a sumptuous affair prepared by our in-house chef catering for your specific preferences. Dependant on the weather, meals are served at a variety of locations for your enjoyment. Enjoy brunch on the verandah overlooking the riverbed, high tea on the viewing deck overlooking the water hole; enjoy the open air boma with fireplace at night time where dinner is also served. In addition there is an elegant dining room for the cooler evenings with it's inviting lounge and fireplace. Enjoy your interaction with other guests at this time sharing the experiences of a different kind. A romantic dinner in our specially designed cellar with a view over the water hole is not to be missed during your stay. It boasts an impressive selection of local and foreign wines for your enjoyment. With your holiday, safari or business trip from in to Shumbalala Game Lodge in Kruger National Park.